It’s that time of year again, (actually I’m a little late to the game), time to plan school. I have all my curriculum and now I need to put it in order, so I have an idea of what each day will look like. The first thing I like to do, after I have my curriculum, is print out a goal sheet, which will go in the portfolio at the end of the year. It’s important to know what I’m aiming at for each student, before looking at the curriculum. I can always add more after looking through the books. After the goals are filled out, I start tackling Tapestry of Grace. It is our most intense curriculum, so I like to get it started while I’m full of planning energy. I look through each week plan’s book list. I write down whether I have the book or make sure the library has the books I don’t own. Then for a change of pace I grab each students books, with the teacher’s books. I start with the Joel’s, because I have already done those lessons with the girls, and I can get through them pretty quickly. 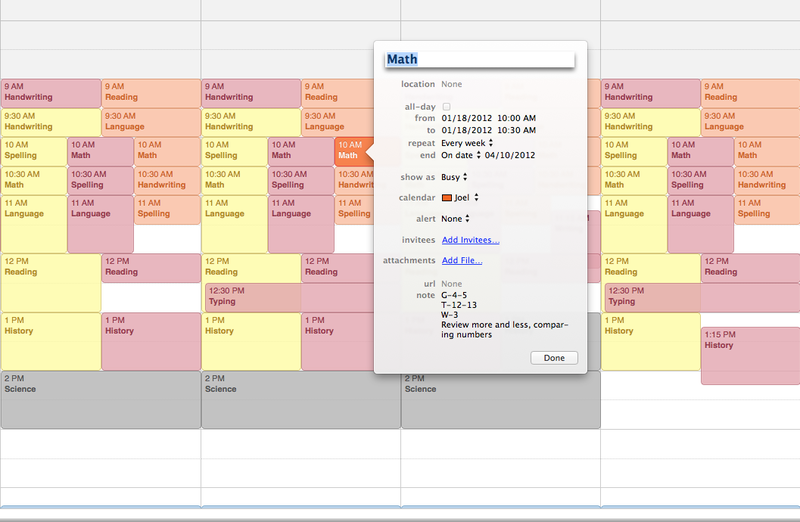 I use iCal for my lesson planner, similar to the way I use it for my cleaning schedule. I plan 9 weeks at a time, and then take 1 week off to plan the following 9 weeks. I make a new event and label the event with what subject I’m planning. Then I pick a time, but I don’t really pay attention to it. Picking the time just makes it visually easier for me. I repeat it for the days of the week I decide to do that subject. I make sure that calendar is set for the specific child. In the notes I put what lesson we’re doing, on what pages, and a title of what we’re learning. I can also add a url address if their is a certain website I want to use with that lesson. Before I get too far, I make sure that I don’t have the subject scheduled on a day we might take off for vacation. After I’m done with the first event and have repeated it, I can easily just fill in the lessons on the repeated days. The subjects we all do together I make a new calendar called all. I tried using a paper planner my first year and I was erasing and rewriting so much, it was exhausting. 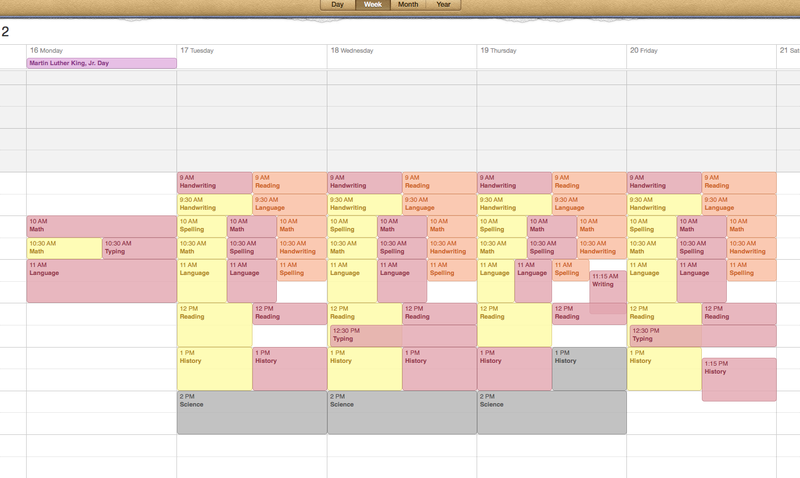 I like the visual of seeing the different calendar categories in the colors I choose. I like the ease of moving things around if we miss a day or do more than one lesson in one day. Having iCal on my computer and my phone means it’s always accessible. It is easy to print out an weekly assignment sheet for each child. I can also easily print out the schedule for records, if needed. I use iCal for all my scheduling, so it’s nice to not have to look at multiple calendars to see what might be going on. Now I’m off to it! The plan is to start school in two weeks and I am just getting started on my planning. What do you use to plan your homeschool lessons? Love your goal sheet idea – will probably do that this week! I have them, but they’re in my head! I’m glad you like it, Patty. It is nice to have something to refer back to and keeps you focused.